WordPress to LaTeX with Pandoc and J: Using TeXfrWpxml.ijs (Part 3) | Analyze the Data not the Drivel. This entry was posted in J, Programming, Software, TeX/LaTeX and tagged export xml, J, john macfarlane, jsoftware, LaTeX, latex converter, LaTeX directories, LaTeX2e, Pandoc, Programming, Source Code, WordPress to LaTeX by John Baker. Bookmark the permalink. Pingback: WordPress to LaTeX with Pandoc and J: LaTeX Directories (Part 2) « Analyze the Data not the Drivel. Could you message me with some pointers about how you made this blog site look this good, I would be appreciative. Most of the work is down by the theme. To get started I would browse the WordPress themes. Most of them come with fairly clear controls that let you set backgrounds, menus, fonts and so forth. The only manual interventions I do are placing figures and inserting the odd bit of HTML and LaTeX. I found your blog while looking for tools to convert WordPress xml files to latex. I know latex quite well, but not at all xml. I tried many solutions, and yours is the only one that worked for me. So thanks a lot for that! Then I tried to understand why only WP articles were accounted for in the conversion, not the WP pages of my website (lacuisine.dkulcsar.fr). So I looked into TeXfrWpxml.ijs but it’s too difficult. Do you have any clue why it is so and how to fix that? Thanks for your note. 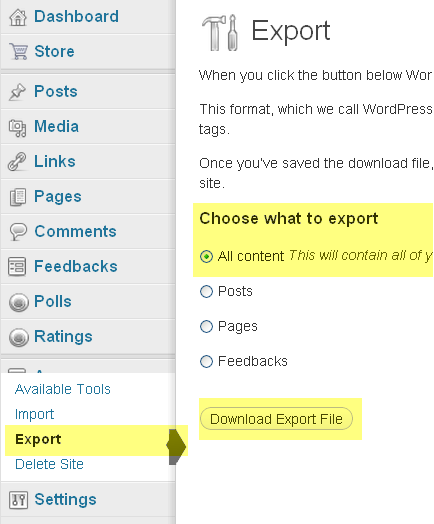 The WordPress to LaTeX converter I put together only converts posts. I don’t convert other pages. On my blog the additional pages don’t follow a post pattern and the amount of material is limited so I didn’t bother converting them. This may not be true of others. Changing TeXfrWpxml.ijs will not work for you but the source XML document contains the other pages as well. You can find them with a text editor and if your non-post pages are short like mine a manual conversion may be all you need. Good Luck. thanks for answering. I will convert them manually then, it will be faster! Pingback: Jacks Repository | Analyze the Data not the Drivel. Thank you very much for your work! I have used your tutorial to download a few travel posts I would like to put together in a pdf, and now I am at a point of editing the .tex files – and I have got them with far less hassle than I thought! I’m glad it was useful for you. Thanks for dropping a note. I had read these posts earlier but thought that they were too complicated for my needs. However, now I think that not following something similar (I intend to use Makefiles instead of batch/bash files) is complicated. So, thanks for posting this workflow. It has helped me immensely. Also, I’d inquired about J in one of your posts (Open source Hilbert for Kindle) a couple of years ago and you’d advised me to join the J forums (which I did promptly and enjoy it immensely…to this day). So, thanks for all the good and useful advice. We’re always glad to welcome another person interested in J. I’m glad the posts helped. Thanks for dropping by.